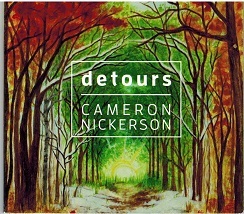 Cameron Nickerson is a singer/songwriter from Yarmouth, Nova Scotia now based in Halifax. With bluegrass roots to branches of Rock'n Roll, Americans and folk music, he incorporates a mixture of it all. He has a life-long music career from bands like The Rockabilly's and shared the stage The Stanfield'sand The Sheepdogs, this is Cameron's first ride on the solo train. He released his debut album, Detours in January 2018. The first single off the album, Jeremiah has garnered radio airplay across Canada. The album was recorded at Codapop Studios and produced by Blake Johnson. Cameron does a fine job singing and writing, and the future looks very bright for him. We can forsee music award nominations for this album, and Atlantic Sebreeze gives this album high ratings on its rating list. For more information regarding Cameron and his music, including his videos, refer to his website, address posted above.